Rhetorically charged debates over theory have divided scholars of the humanities for decades. 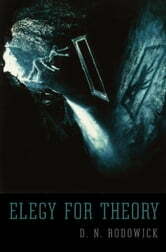 In Elegy for Theory, D. N. Rodowick steps back from well-rehearsed arguments pro and con to assess why theory has become such a deeply contested concept. Far from lobbying for a return to the "high theory" of the 1970s and 1980s, he calls for a vigorous dialogue on what should constitute a new, ethically inflected philosophy of the humanities. Rodowick develops an ambitiously cross-disciplinary critique of theory as an academic discourse, tracing its historical displacements from ancient concepts of theoria through late modern concepts of the aesthetic and into the twentieth century. The genealogy of theory, he argues, is constituted by two main lines of descent--one that goes back to philosophy and the other rooted instead in the history of positivism and the rise of the empirical sciences. Giving literature, philosophy, and aesthetics their due, Rodowick asserts that the mid-twentieth-century rise of theory within the academy cannot be understood apart from the emergence of cinema and visual studies. To ask the question, "What is cinema?" is to also open up in new ways the broader question of what is art.